Beautiful stained glass artwork for your sidelight windows. 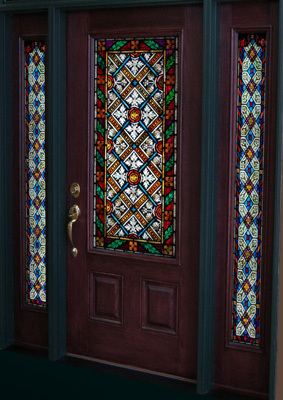 A stained glass sidelight window is a tall, narrow window that borders each side of a main doorway. Sidelights can be used for additional interior applications as well. Sidelight windows most noticeably increase the size of a doorway entrance, especially when viewed from the outside. Sidelight windows can come in a variety of styles and sizes. Some sidelights measure the full length of a door, whereas others only partially cover the door. 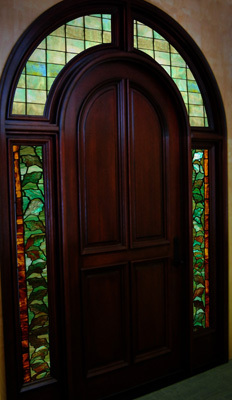 We will custom design your sidelight window to suit your needs for single or multiple panes of stained glass. Our stained glass not only adds that special touch of elegance to any setting, but also provides the extra benefit of privacy. Along with transom windows, stained glass sidelight windows can increase the focal point and visual importance of your churches main entrance. Not sure what style to choose? Call us! We are here to help.